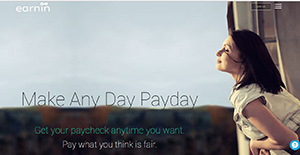 Earnin is a simple and fast financial wellness app that gives you the power to access your paycheck when you need it. It’s a reliable financial service that allows both hourly and salary workers to withdraw some amounts from their check before the payday. Earnin is a free package that doesn’t charge you interest or fee on pending wages but instead requests for a tip (of up to $14 per withdrawal) for its services. This program (formerly known as Activehours) is designed to track how much you earn and how often you work to set limits. Users cannot make withdrawals that exceed their limit or affect their ability to pay back. Earnin seeks to bridge the gaps left by big financial service providers who often offer a traditional two-week pay cycle that doesn’t suit everyone. Like any other financial service app, Earning requires your personal and banking details. The security of these details may be a concern for many users. However, the app makes use of stringent security techniques including 256-bit encryption technology to guarantee the privacy and security of users’ information. This is the same level of security utilized by popular online banks. It provides a Balance shield feature which is a non-compulsory overdraft avoidance tool. If you opt in, the feature directs the app to send a specified amount (usually not more than $100), when your bank balance falls below $100. The feature offers financial protection and prevents your account from being overdrawn. This strategy is usually inexpensive than forfeiting an overdraft fee. Earnin puts you in control of your earnings. Whether you are an hourly or salary employee working it will shorten the wait for your paycheck. It ensures your hard-earned cash goes straight to your account, giving you the power to use the amount when you need it. Better still, the application enables you to access the payments within minutes of the request thanks to its lightning speed program. Setting up the app is straightforward. You just enter your information including timesheets used in your workplace, payday information, your location, and connect your bank account. The app integrates seamlessly with your employer’s attendance and time tracking systems. Users can easily monitor their earnings via the Earnin dashboard. The solution also gives you the freedom to opt in for notifications, so you are always updated when pay is available. If you are considering Earnin it could also be beneficial to check out other subcategories of Best Mobile Payment Systems listed in our base of B2B software reviews. Every company has different wants and needs a software that can be personalized for their size, type of employees and customers, and the specific industry they are in. For these reasons, no software can proffer perfect features off-the-shelf. When you try to find a software product, first be sure what you want it for. Read some Earnin reviews and ask yourself do you desire basic functionality or do you want complex features? Are there any industry-specific functionalities that you are seeking? Get the answers to these questions to help your search. There are plenty of aspects that you need to mull over and these include your finances, specific business needs, your organization size, integration requirements etc. Take your time, try out a few free trials, and finally zero in on the app that offers all that you need to boost your company competence and productivity. How Much Does Earnin Cost? Earnin enterprise pricing structure requires users to pay no fee to use the platform. We realize that when you make a decision to buy Mobile Payment Systems it’s important not only to see how experts evaluate it in their reviews, but also to find out if the real people and companies that buy it are actually satisfied with the product. That’s why we’ve created our behavior-based Customer Satisfaction Algorithm™ that gathers customer reviews, comments and Earnin reviews across a wide range of social media sites. The data is then presented in an easy to digest form showing how many people had positive and negative experience with Earnin. With that information at hand you should be equipped to make an informed buying decision that you won’t regret. What are Earnin pricing details? What integrations are available for Earnin? If you need more information about Earnin or you simply have a question let us know what you need and we’ll forward your request directly to the vendor.